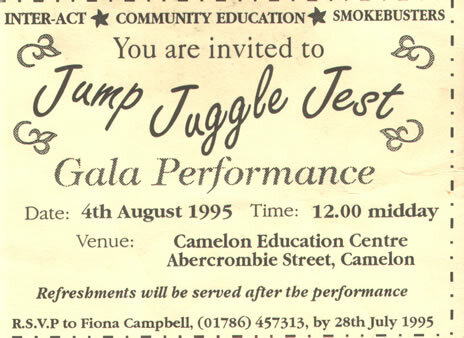 Jump Juggle Jest (JJJ) was a Scottish Juggling Charity set up in Forth Valley (Stirling, Clackmannan and Falkirk regions) from around 1994-2000. This page aims to keep the memory alive! The Charity hasn’t folded (as far as I can remember)- it’s just not been active for many years, so the story may not end just yet if someone feels inspired to take on the organising role and pick up where we left! If you were involved in JJJ, please get in touch and say hi! We operated with a core team of volunteers who are either young people or parents who have came into contact with, or been approached by JJJ. 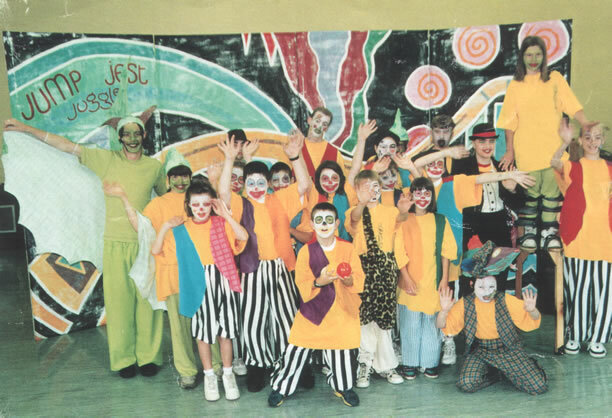 I joined JJJ in 1995 for their production of “Not a Lottery Time To Lose”. After taking part in their two week summer school, I joined the newly formed committee as Secretary. 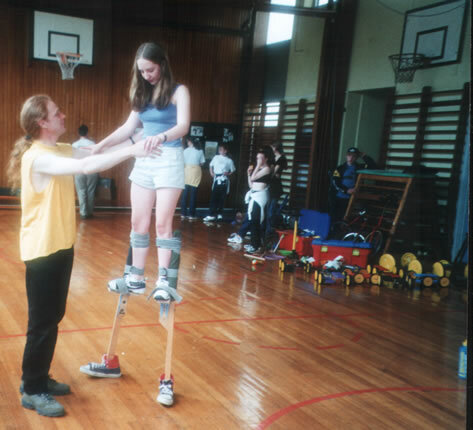 A year later, we applied for Charitable status and became Scotland’s first ever circus and performance skills charity. 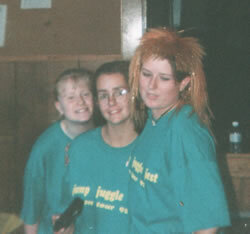 JJJ is a force of fun and a catalyst for action, expression and positive youth work. It is also a unique charity. 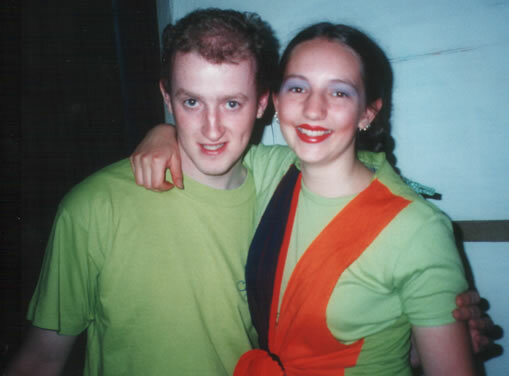 We haveperformed 7 stage shows, and been involved in a variety of one off workshops, introductory programs for youth workers, many street parades and festivals and the running of several juggling clubs. SYNOPSIS: (roughly based on Bill and Ted’s Excellent Adventure, and the National Lottery!) A family from the future win the lottery and hire a dodgy time travelling machine to go back to 1995 and visit the Circus. The machine somehow sends them back to the jungle age, where they pick up some diabolo wielding jungle people! The machine then goes to the stone age where they meet a wise old wizard (me!) The family accidentally pick up some stone age dudes and then finally all of them end up at Circus 1995 where a show is put on for them by the ringmaster and her performers. (I got my own 5 minute juggling slot)! 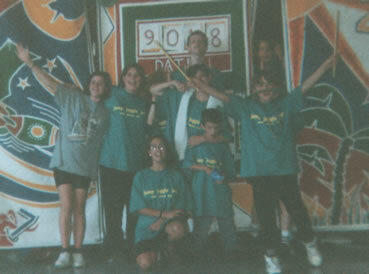 This was JJJ’s second show (summer – 1995). It was a two week workshop. 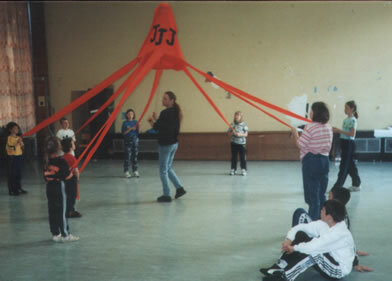 The first week was spent teaching 20+ children to juggle, and the second week was spent devising a 40 minute circus/drama/comedy show and touring round the local community centres. 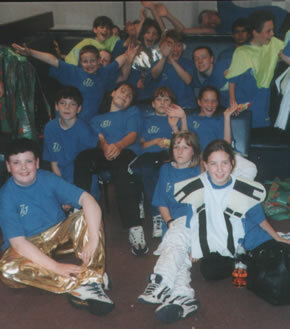 The Gala performance was the culmination of two weeks of hard work by the members of the production team and participants…some of us overcoming shyness or boredom or transport problems, each of us contributing our skills and enthusiasm to make the show work; and all of us making full use of the opportunity to get involved. We brought in some extra drama workers for this production and made a very stunning Nessie costume! 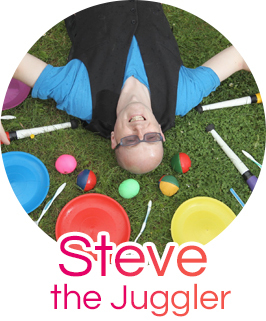 I played various roles and had my usual chance to show off juggling skills! In 1997, JJJ had became a Charity. I was involved with fundraising, and grant applications, but nothing would beat the feeling of being on stage. I started off with quite a small acting role this time, but as time went by, other people dropped out, missed rehearsals, or missed their lines, so my role grew quite large in the end. I played the part of a crew member of a space shuttle involved in a race back home with an antidote to save the Universe. The title was due to the fact that X-Files was very popular at the time! SYNOPSIS: Well – the clock is running up to the end of the Millenium and the beginning of the next. Have all the Y2K problems been solved? Do we really know if we’ve got the date right? more importantly will Country and Western replace Boyzone and the Spice Girls? 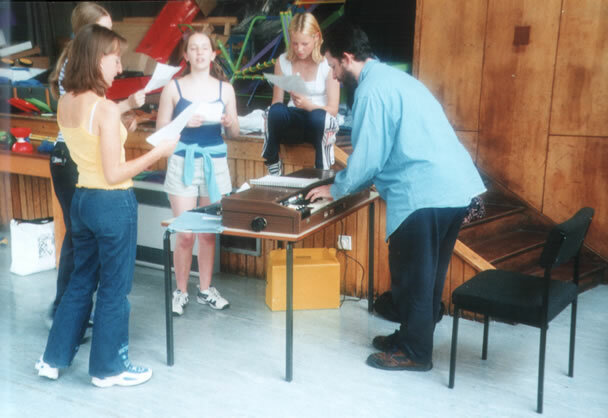 I played one of the main characters, and was on in every scene (even playing the keyboard in one scene). I played a mad professor (Bill Geeks) who had accidentally sent a virus e-mail to every computer in the world, and had to find the antidote in the next 24 hours before the world would end!